Community involvement is alive and well at ESF. According to a National Assessment of Service and Community Engagement survey conducted in the spring of 2014, about 76 percent of ESF's undergraduate population volunteers in some way. "That says a lot about our students," said Meagan Pepper, ESF's program coordinator for community service. Nowhere is commitment to community service more evident than campuswide blood drives. 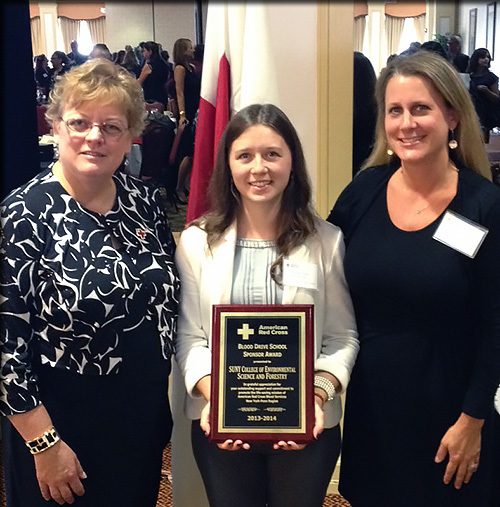 Within the last few years, ESF has won several awards from the Red Cross for its dedication to campus blood drives, including Outstanding Support for the Community Blood Drive Program (2011-12), Outstanding Blood Drive Collections (2012-13) and, most recently, the Blood Drive Sponsor Award given in September 2014. This last award, presented at the annual New York-Pennsylvania regional meeting and luncheon in Rochester, N.Y., recognizes institutions that, according to the Red Cross, display "exemplary commitment to achieving the Biomedical Services' mission to fulfill the needs of the American people for the safest possible, consistently available, most cost-effective blood and blood products through voluntary donations." Last year, ESF collected 230 units of blood during the five blood drives that were conducted during the academic year, according to ESF's American Red Cross account manager, Katie Stepanian. That's an increase of 3.6 percent from the previous year and a participation rate of 13.15 percent among students. In addition, ESF was the only college to win the award in the region. The reason for the high student participation can be attributed to students like Lia Dombroski, who is ESF's current student coordinator for blood drives and serves under Pepper, the blood drive coordinator. Dombroski is in charge of organizing and advertising blood drive events, which includes building a committee, recruiting volunteers and donors, and collaborating with an American Red Cross representative to organize the event. The combination of incentives, such as donations and coupons from local businesses, and having blood drives run by students all come together to make campus blood drives successful. "Simply put, ESF is made up of really awesome, caring people," Dombroski said. She is currently reaching out to more businesses to increase student involvement and creating a red cord program that she said will "provide seniors who volunteered/donated a certain number of times with a red cord on graduation day to symbolize their selflessness and involvement in the community." The next blood drive will be 10:30 a.m. to 3:30 p.m. Nov. 12 in Alumni "Nifkin" Lounge. Students can either donate blood or time by volunteering at an information table in the Gateway Center, hanging flyers, or signing in donors the day of the drive. Anyone who is interested in participating should contact Dombroski at ledombro@syr.edu.